The newly painted cab is now in situ on the chassis and giving a very pleasing appearance to the rear end of the loco. Some work has taken place within the cab such as trial fitting of floor plates and the ashpan damper control column. 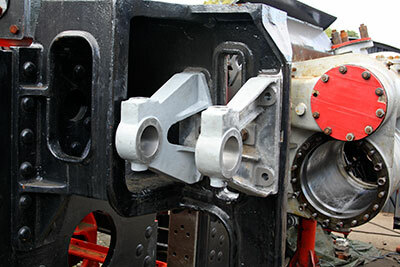 Trial fitting of other items has taken place recently notably the expansion link brackets and cylinder cladding. A section of vacuum piping at the rear of the loco has been shaped. 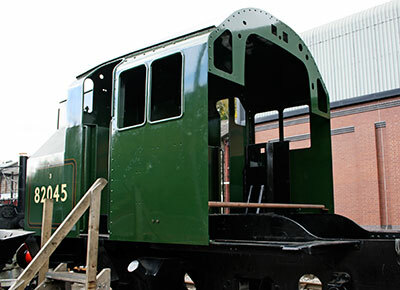 The machining of the chassis horn guides is now complete and the hired machine has been returned to the West Somerset Railway at Minehead. We now have a set of acceptable measurement figures to work with in progressing the axleboxes to correctly fit within the horn guides. We still have a little way to go to achieve that goal but at least are moving in the right direction now. 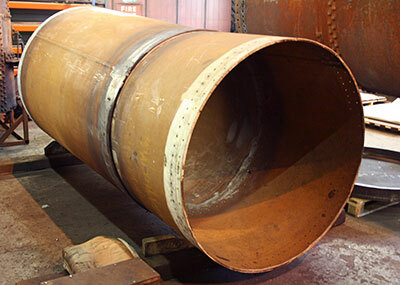 The two sections of boiler barrel are now united and pilot holes have been drilled around the joint area. The next job is to open out these holes to rivet size. Machining of various components continues. 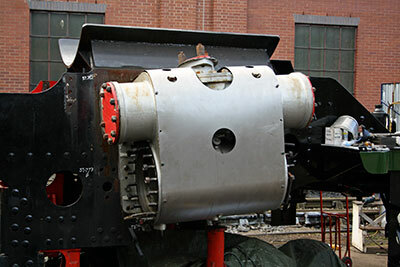 As Tony reports above, the hugely time-consuming work of machining the axle box faces is now complete, bringing the day when the loco becomes a rolling chassis closer. I think that this is an appropriate time to say a sincere thank you to our indoor team of skilled chaps, who have worked quietly and uncomplainingly on a job that can most politely be described as "steady"! In particular, I'd like to mention Richard Fraser, Alan Harris, Rick Jarvis and David Struckett, whose skill is outdone only by their modesty. Thanks so much, gents: if we'd had to pay the commercial rate for what you do so unobtrusively, our finances would have taken a big hit. The fact that the project would attract so much nous, on a variety of fronts, was never foreseen, and it's fair to say that this has made 82045 the envy of many other groups. The newly painted cab in position. Photo: Tony Massau. The boiler barrel sections united. Photo: Tony Massau. The expansion link brackets temporarily in position on the right hand side of the chassis. Photo: Tony Massau. Cylinder cladding temporarily in position on the right hand side of the chassis. Photo: Tony Massau.